I love parties. I know they can be stressful and expensive, but I love hosting them. This one was one of my favorites. We were able to keep this party pretty inexpensive by creating as much as we could on our own. 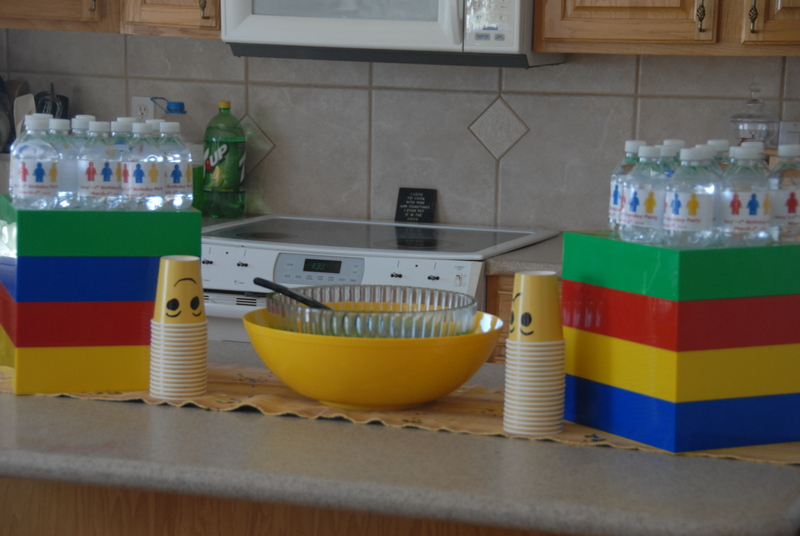 Lego party supplies are difficult to come by and can be expensive, but luckily, Lego’s are primary colors..so you can get creative on the cheap. Here are a few ideas that were simple to create, but gave us a big bang for just a few bucks. 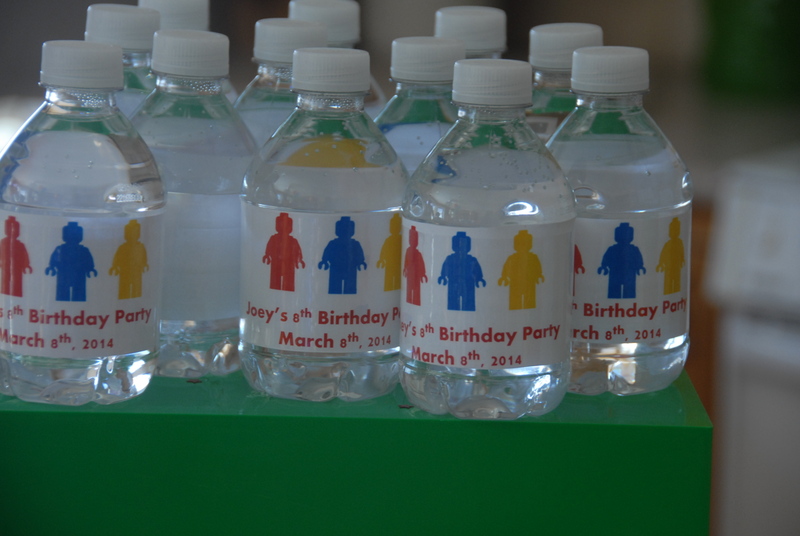 You are probably buying bottles of water for your party anyways, so why not step them up a notch and personalize them to help your birthday child celebrate the day. All you have to do is find some clip art online and create labels in word or PowerPoint! Simply measure the label on your bottles, then make these simple labels to fit. I tape mine on with packing tape around the entire label..making them waterproof and very professional looking. You can buy labels online…but why spend the cash on something SO simple? My kids love a pinata! I actually looked around for a quick pinata fitting the theme to buy..but no luck. So, this is a box from Amazon and two old empty brie cheese containers. 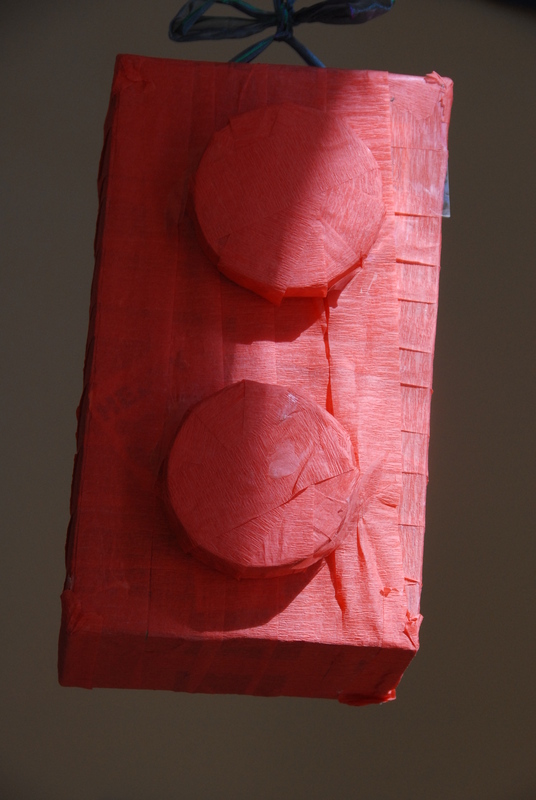 I simply wrapped and glued red crepe paper on them, pieced them together, filled it up and made a hole for hanging. Viola! Total cost? Maybe 99 cents for the crepe paper. I filled ours with rubber bouncy balls and other various toys. Since the kids are older at this party, they had a blast chasing those balls around the house when this burst open! My number one rule for easy parties that don’t drive you crazy is to keep it simple wherever you can. We used primary colors and balloons for a simple table. 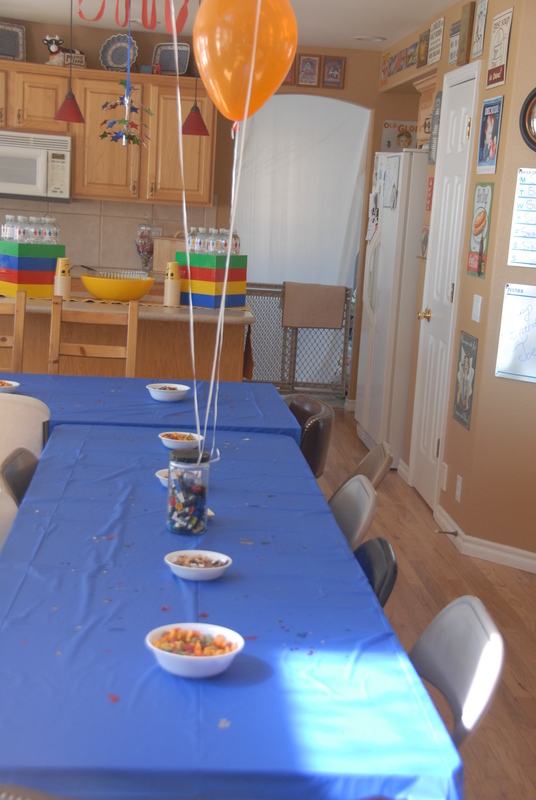 The balloons are simply tied to jars filled with Lego. Kids don’t need it to be complicated to have a good time! 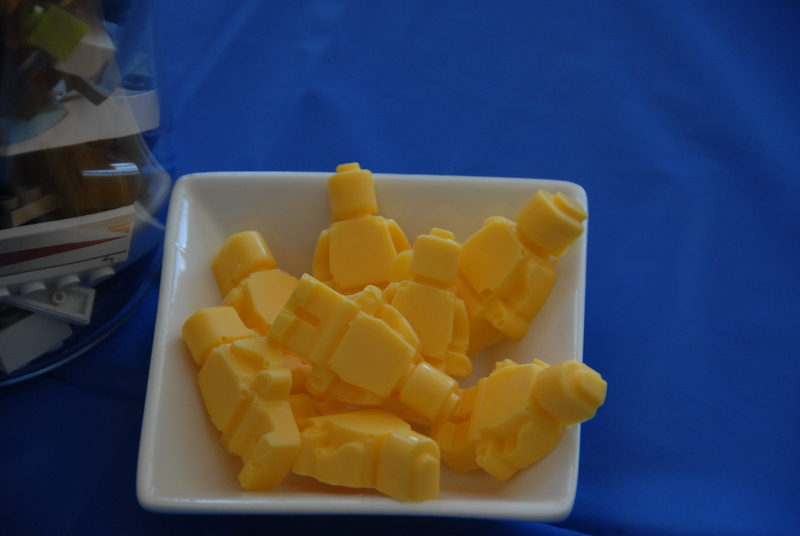 On the table, goldfish crackers, trail mix, and these adorable white chocolate Lego men, made with Wilton candy pieces and a mold I bought on Amazon! We continued the “building theme” by letting the kids make their own individual mini pizzas. We just popped those into the oven while the kids carried on playing Lego themed games (build the tallest tower, theme building activities, etc). Very simple. For a quick sweet treat, we served up Lego on a stick. This snack is easy. 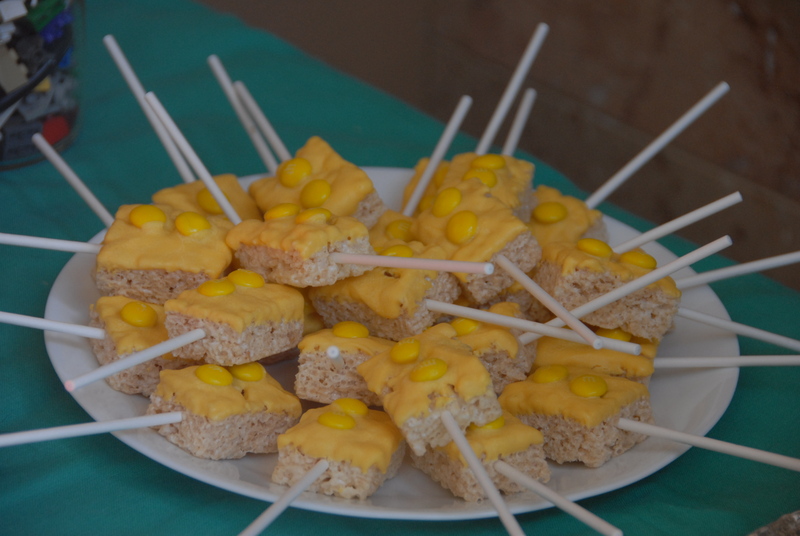 You need: Rice Krispie treats (make your own or buy them), Wilton yellow candy coating, yellow M&Ms, and a long lollipop stick. You could change up the colors as you wished. You just melt the candy coating, frost the treats, add M&Ms, let them dry, then stick them on that stick. Done! You can order a bakery cake, of course. 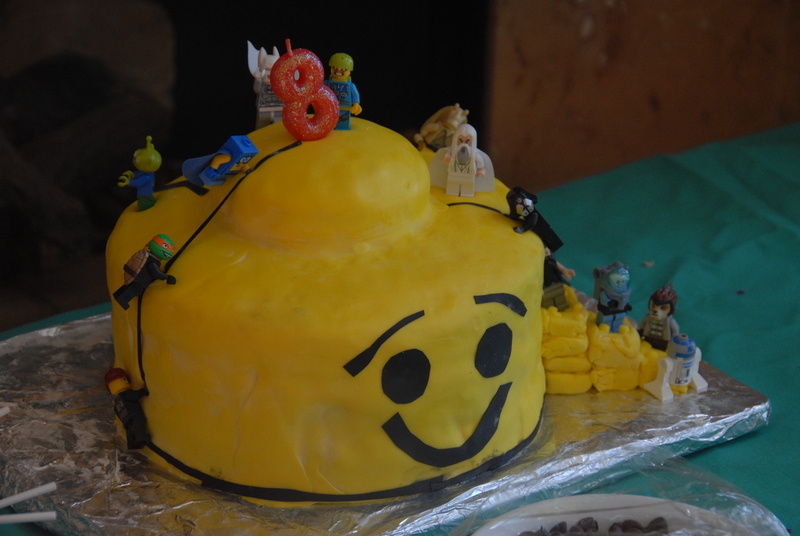 But, this Lego cake was pretty simple. I simply baked up two round cakes and a cupcake. I stacks the cakes, just like you would normally do (I used whipped cream filling between layers) and added the cupcake on top. I simply covered this in store bought fondant that I colored yellow, them used back sugar sheets to make the expression on the Lego mans face. 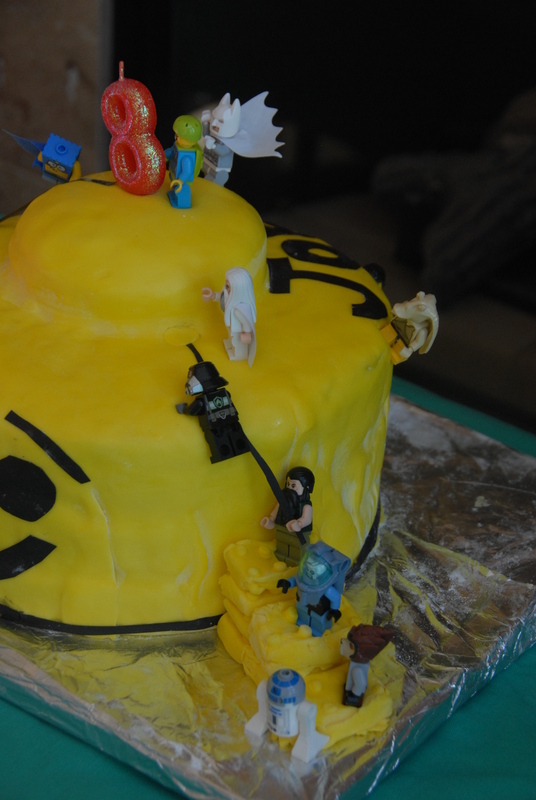 I added stairs made of fondant then used our (clean) Lego figures to have them “climb the cake” to try to get to the candle. This was my first experience with fondant on a large cake, but I was fairly happy with the result! 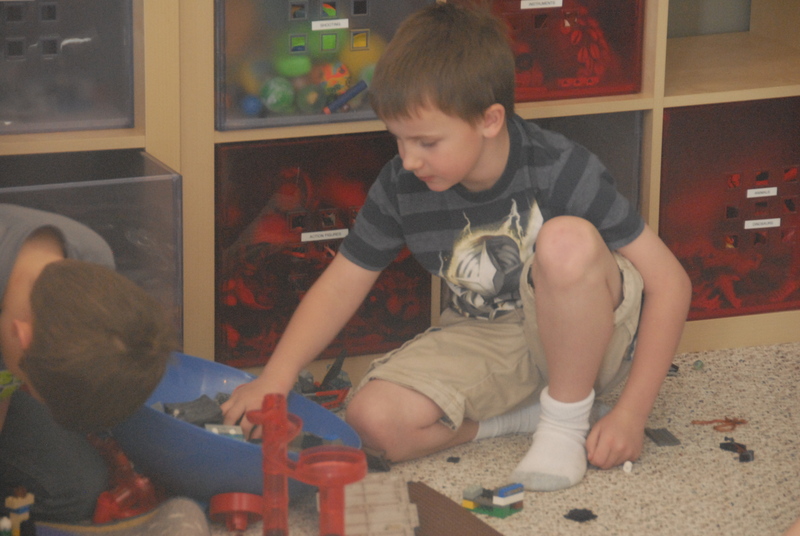 In keeping with keeping things simple, I raided our kids Lego area for lots of inspiration. I used duplos (found in a tub in the garage from when my kids were little!) 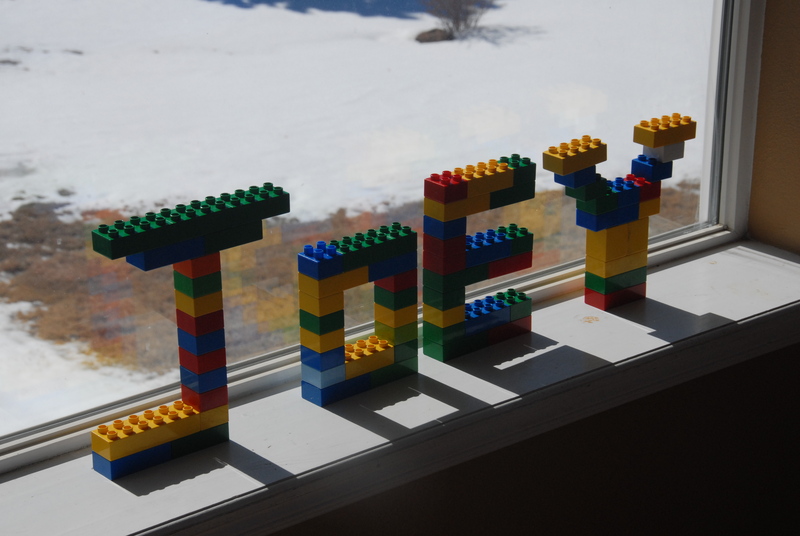 to make the birthday boys name in Lego for the window sill. Then for fun I did his age, too. Yes, that’s supposed to be an EIGHT! 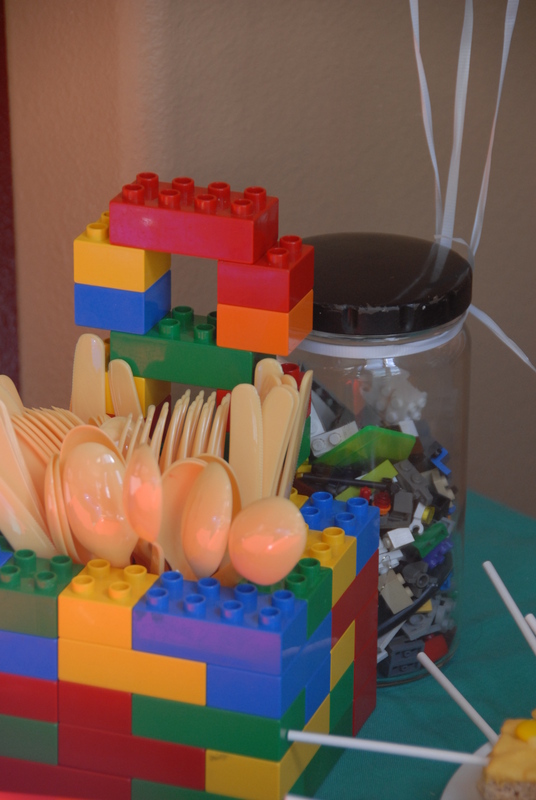 Then I used some duplos to create a utensil holder as well! I found some Lego storage in the boys room (these are Box 4 Blox brand) and used them to bring color and height to the drinks area. We had some great building fun, yummy food, and a great time with our friends. The best part? This was a pretty stress-free affair. Though we had some games set up. 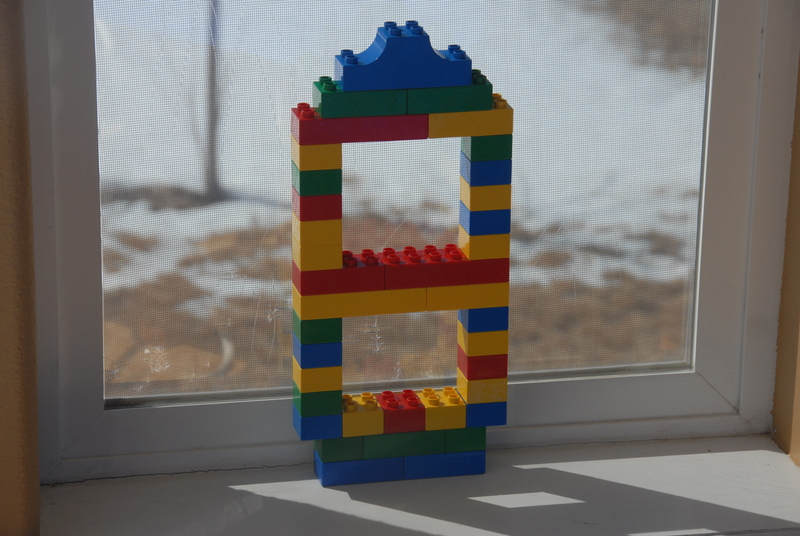 It was clear that the kids really wanted to enjoy building from the big bowls of Lego I had set in the playroom. 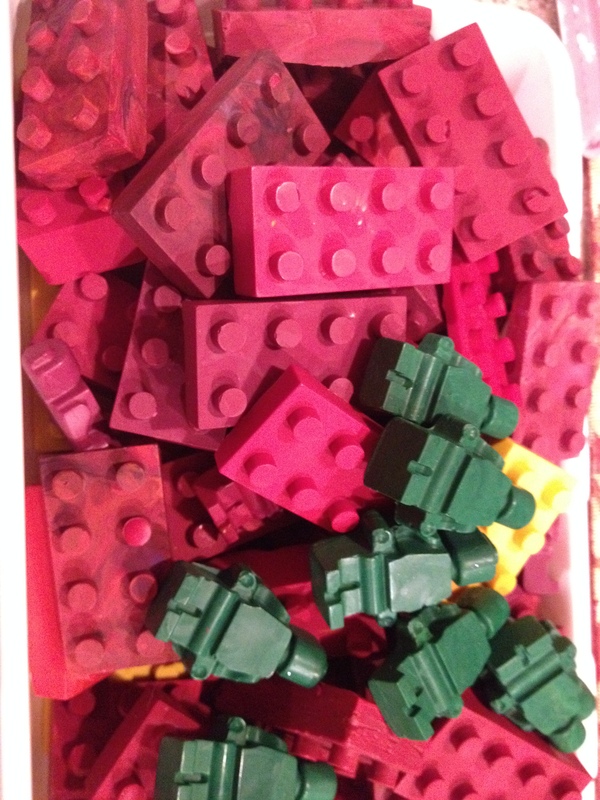 I had Lego Shaped crayons (I really got my mileage from the different molds I bought..though you do not want to use the same ones for food and crayons) by using old crayons, melting them down, then molding them. These were on a table with coloring sheets (printed from the internet) for any kid who might like to use them. They were a hit with all the kids, young and old. Do you have a favorite party theme or one that you most remember throwing for your own kids? I would love to hear about it! Author DustyBootsPosted on 04/13/2016 10/21/2016 Categories Party Animal!